Fouling of vessels is known to reduce efficiency, increase drag and increase fuel consumption. Also, the increased weight to mooring lines caused by fouling organisms may hinder the ease end users have of handling them. It is in the interest of owners to keep fouling off vessels and lines and thereby protecting the environment from harm caused by translocations of invasive alien species. Keep boats in water for as short a time period as possible. Treat your boat with appropriate antifouling that adhere to the craft manufacturers recommendations and prevent build up of organisms. When treating a craft, 100% surface cover with the chosen method is essential. Small areas left available for plant or animal growth can give species the opportunity to colonise new areas. Antifouling paints are designed to present aquatic organisms with a barrier to prevent settlement. These compounds are sometimes toxic to humans, aquatic organisms and terrestrial species and care should be taken to follow the guidelines stipulated by the manufacturer at all times. Work indoors: Where practical, conduct vessel maintenance indoors or under temporarily covered areas where the rain cannot cause runoff. Sheet plastic shelters can be used. Work away from the water: At a minimum, always move boats inland to an approved work area before scraping or power washing the hull. Do not perform hull maintenance activities on the launch ramp area or in the lift well. 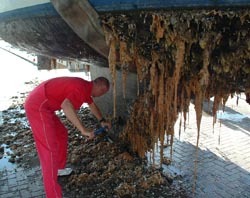 Do not clean your boat while it is in the water: Never dive/use divers to remove growth on the bottom of boat hulls. This not only represents a health and safety concern but cleaning of biofouling by this manner also removes anti-foulant paint and associated pollutants. Use dustless vacuum sanders: Dustless sanders use industrial vacuum cleaners to trap dust created in the sanding process before it becomes airborne. As the sander removes paint, dust is drawn into several holes located through the sanding pad. The dust is then sucked into a vacuum container that can be emptied for disposal. Dustless vacuum sanders are one of the best ways to control paint dust before it can become a pollutant. Added advantages include keeping a clean workplace, reducing health risks and reducing cleanup costs and time. Ensure you follow manufacturer’s guidance or receive training on the safe use of this equipment. Use tarps and filter cloth: Use tarps and/or filter cloth to catch scrapings and other debris produced during maintenance work. Tarps and cloth are inexpensive “low-tech” methods to collect debris before it can be washed into coastal waters by storm water. Filter cloths are better than tarps when boat work is expected to last longer than one day. Should it rain, the water passes through the cloth instead of washing the debris off the tarp. Maintain clean and tidy work area: Clean up the designated work area after scraping and painting. Leaving areas cluttered and messy will cause spills and allow pollutants to be tracked outside the work area. Painting: Because hull paints contain toxic pollutants, they should be used with care. Consider the following when painting your boat. Maintain designated work areas: Restrict mixing of paints, solvents, and reducers, as well as the painting itself, to designated areas that are located on a hard surface and isolated from the weather. Do not spray paint while boat is on the water: Sprayed paint can be difficult to control. Paint can be inadvertently sprayed into the water and expose aquatic life to toxic chemicals. Use spray enclosure: A spray enclosure is a permanent shed or temporary structure housing a boat during painting. Spray booths confine overspray and prevent drifting onto other boats, land, or water. When using traditional paint application techniques use brushes and rollers where possible. Traditional applications are known to reduce air emissions. Some manufacturers stipulate the use of rollers or brushes so always consult manufacturer’s guidelines. When spray painting, use efficient high volume, low pressure (HVLP) spray guns: HVLP sprays are one of the most efficient means for applying paint. Use a spray gun that is rated at 65 percent efficient paint transfer or greater. These spray guns direct more paint onto the intended surface and as a result, less paint gets into the air, and fewer chemicals are released. Always maintain appropriate use and storage of hazardous materials and waste: Make certain that all painting materials are used strictly according to manufacturers’ instructions. Keep covers and caps on paints, thinners, and solvents to minimise the release of toxic compounds. Clean up paint and supplies: Treat paint spills like oil spills. Clean up immediately with absorbent materials, paper, and/or rags. Since liquid paints are classified as hazardous material, dispose of paint brushes and paint properly.